The Devons were looking for a snack or a mouse. With boxes and ribbons, oh my what a sight! And having as much fun as Christmas should be! The Devons would drag them to under the tree! Santa had been here and up to his tricks. The Devons found boxes and wrapping galore. Far better than any cat toy at the store! The house was a mess, the truth to be told. Well fed, well played and with not much to do. And from Planet Devon a Happy New Year! 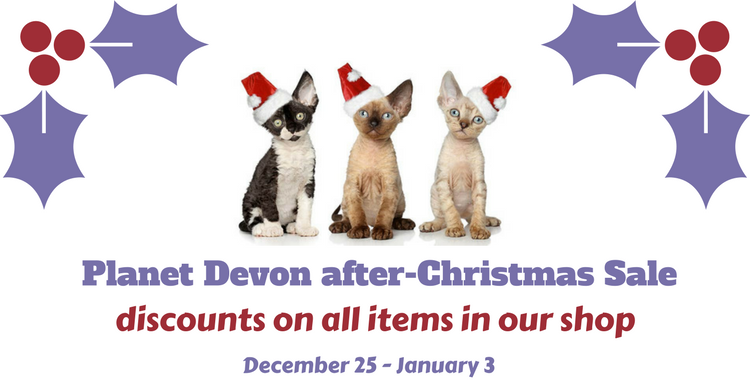 As part of our wishes for a wonderful New Year, our Planet Devon Shop has discounted all items through January 3rd.